gotoPage() Move to page with specify page number. Start with zero. nextPage() Move to next page. prevPage() Move to previous page. currentPageIndex() Get the id of current page (right spread). numPage() Get the number of pages. Description Method; Move to page with specify index. Description Method; Move to next page. Description Method; Move to previous page. xml: URL of external xml file. Or XML object. //Load the source xml named books.xml. Description Method; Start the component if xml is loaded and the component not started yet. Description Method; Stop the component when the component is in started state. Description Method; Return the current page index of reight spread. Returns Number. The total number of pages of the book. Description Method; Return the total number of pages. Broadcast when the book change to a new page. pageZoomIn PageTurn3DEvent.ZOOM_IN Broadcast when the book is zoomed in and stop. pageZoomOut PageTurn3DEvent.ZOOM_OUT Broadcast when the book is zoomed out and stop. complete ItemEvent.COMPLETE Broadcast when the all buffer images loaded. source String The path to the xml generate by Photoshop Web Gallery Function, Flickr rss or Youtube rss. 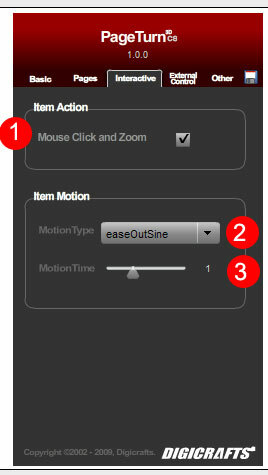 itemClickAction String Determine the action do when mouse click on the items. "ZOOM" "ZOOM"
numPage Number Number of pages. started Boolean Determine about the components if it is started. length Number Length of the current datasource. 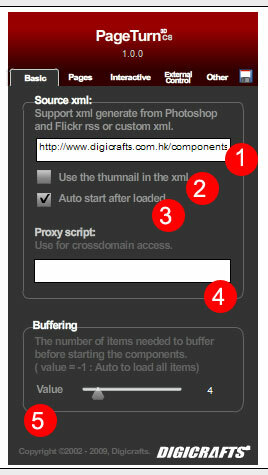 1 source The path to the xml generate by Photoshop Web Gallery Function, Flickr rss or Youtube rss. 2 useThumbnail Enable/disable using thumbnail image defined in the xml for image source. 4 proxy The proxy script for cross domain issue. 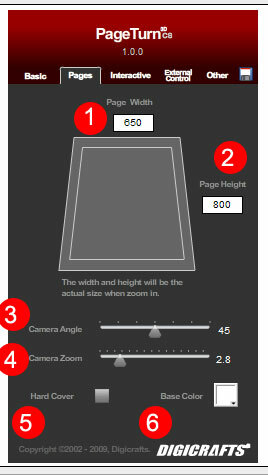 1 itemWidth The prefered width of each page. It is the actual size when zoom. 2 itemHeight The prefered height of each page. It is the actual size when zoom. 3 cameraAngle The angle of view. 4 cameraZoom The zoom level of the camera. 5 hardCover Enable/disable hard cover. 6 itemBaseColor Set the base color of item. 1 itemClickAction This enable item zoom when click on page. 2 transitionType The transition type of the animation. 1 keyboardControlEnabled Enable/Disable the keyboard control. 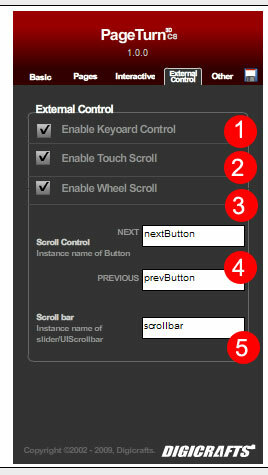 2 touchScrollEnabled Enable/Disable the touch scroll control. 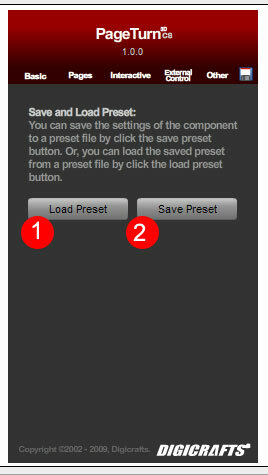 3 wheelScrollEnabled Enable/Disable the mouse wheel control. 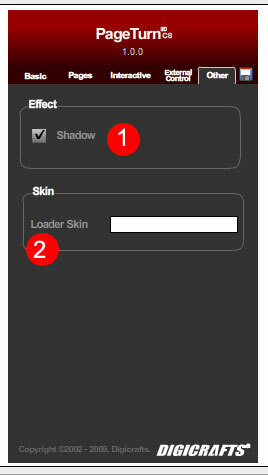 1 shadow Enable/diable shadow effect.